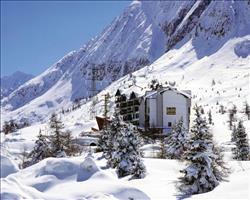 The ultimate guide to Passo Tonale ski holidays. 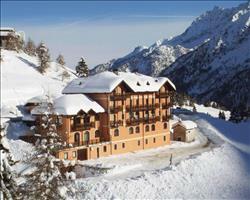 It doesn’t take long to see why this is one of Italy’s top resorts - Passo is a treat for any snow lover. Known for its amazing value for money, you get lots more than you pay for here when you consider the sunny and snow sure slopes, skiable glacier, queue-free lifts, homely vibe and ridiculously tasty food. Up in the Rhaetian Alps at 1883m, rubbing shoulders with Trentino and Lombardy, the purpose built town of Tonale is one of the highest resorts in the country. With a top altitude of 3016m, snow is pretty much guaranteed throughout the season here, as is lots of Italian sunshine. Milan and Verona are the nearest serving airports, where you can find coach, taxi and train connections to the resort. Trains from Milan pass through Verona to Trento where the rail service stops at all of Val di Sole’s top resorts, Passo included. Thanks to the resort being purpose built, everything is easy to get to. The traffic free streets host a pick-‘n’-mix of establishments to make your stay easy and hassle free; for those on a budget there’s a supermarket, rental shops and relatively cheap options for eating out, (we’ve found pizza and pasta from only 5€). For those looking to push the boat out, there are wellness centres in the big hotels as well as equipment shops for buying the latest mountain trends. A superb lift system made up of 29 chair lifts, gondolas and cable cars can carry up to 33,000 skiers per hour. With various ski pass options, it doesn’t matter whether you’re a complete beginner or a prospective applicant to the Adamello Ski Raid (this famous high altitude race that takes place here every spring). The Adamello Ski pass covers Passo Tonale, Ponte di Legno, Temù and the Presena Glacier (the areas in the immediate vicinity) and the Superskirama covers these areas but also the Skirama Dolomiti Adamello Branta area, effectively tripling the original ski area size to over 340km of runs. View our detailed Passo Tonale snow forecast or snow report and see all live webcams, piste maps, road and travel maps and lift pass prices. For a picture of historic snow conditions see the snow depths month by month with our Passo Tonale snow history. As a beginner, having to take loads of lifts to reach the easy runs can be a bit daunting. You don’t have to worry about this here, with the majority of blues near hotels and bars, for those all-important hot chocolate / Dutch courage breaks. Nursery slopes with magic carpets let learners work on snowploughs in short, manageable bursts - when you begin to feel more comfortable, take the Valena chair lift for a couple of mid-length blues. 60% of the slopes have been carefully crafted for intermediates, leading in all directions for quick fire chases and lengthy thigh burning runs. We especially like the long Alpino if you’re after more of a challenge. Presena Destra is a scenic red trail from the top of the glacier leading to the red Presena Paradiso (get the lift the rest of the way down if you don’t want to tackle the following black). If you fancy gliding through the trees, Ponte di Legno has some steeper, wooded runs. For experts, the 3km Paradiso black is amazing, with a vertical drop of 700m. If you make your way up to Cima Presena at 3015m, you can drink in the panoramic views before descending 1215m on blacks and reds for a rippling ride back to the resort. Thanks to the amazing snow, there’s some awesome off piste – hire a guide and take the itinerary route off the Presena, which brings you back to the village, albeit with a ten minute walk. Heliskiing also grants exclusive access to even more of the pow - it’ll feel like just you and Mother Nature out on the mountain. The Adamello Freestyle Arena has jumps, boxes and all the toys, guaranteed to keep all ages entertained for hours on end and the 1000m snow cross means it’ll be a nail-biting race against the clock. Watch out for the Preseno glacier’s snow park, opening later on in the season. Of course one of the best things about Italy is its delectable delicacies, and whether you’re looking for fast food to fill you after a hard days skiing (try La Torretta for their filling pizza) or a more authentic, native dining experience (El Bait serves local, genuine cuisine), you won’t be disappointed. La Voglia serves group sized platters of cured meat antipasti, local cheeses and a deli counter so you can take your favourite products home and enjoy them all over again! Eating on a budget is easy, with fast food dishes from 5€, and you can usually grab a three course meal for about 10€. For evening venues with entertainment for the kids, Nico’s Bar make amazing pizzas and have their own amusement arcade. The nightlife has a laid-back, jovial feel as people come together in Magic Pub and other promisingly named watering holes. Bar Heaven and Crazy Horse both have an excellent atmosphere and play great music - get there for happy hour to really make the most of your evening. The Antares Disco is another exciting spot to let loose and move your feet in a way that’s just not possible when you have skis strapped to them. In terms of activities, the town’s ‘Sleddog’ run means you can have the whooshing-through-tree-trails, husky sled ride you’ve always dreamt of; the hike from Passo de Tonale to Rifugio Citta di Trento includes incredible views and pistes reserved exclusively for sledding and tubing provide no end of fun for all the family. 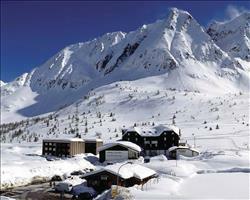 When is the best time to ski Passo Tonale? Passo Tonale’s ski area sits above the town’s settling at 1883m and with top heights of 3016m, this Alpine resort is generally one of the first to open in the ski season come early November, and one of the last left open in April or May. There isn’t much call for snow cannons at such an altitude, but operators have installed some all the same to give the slopes a little dusting when the snow fairy hasn’t been. Located in the Val di Sole (sunny valley), blue skies look promising for this resort all year round, with its mountains pointing towards all 4 faces of the compass. A purpose built resort that works well, just as it is, Passo’s slopes are known for being generally open throughout the season and the lifts are famous for being queue-free. Whether you're all taking to the piste as beginners or this is an annual ski holiday you've been doing for donkey's years, Passo Tonale's a gem for families. Beginners can join one of the ski schools, where areas equipped with magic carpets help make first skiing experiences memorable for all the right reasons. Experienced teens will have a ball on the glacier, doing tricks and turns in the Presena snow park. If the whole family is learning or improving together, book a private instructor for quality time together. Many of Passo's hotels are family friendly, with childcare packages crammed with activities, so tots who aren't yet big enough for ski lessons will be well cared for. More often than not they're very near the piste, making getting from A to B a breeze. Sledding opposite the Hotel Dolomiti provides hours of fun, while restaurants like Nico's offer a variety of cheap but scrumptious pizzas (Nico's has the added bonus of an arcade room for kids can while parents enjoy a quiet bottle of vino). In previous seasons Ski School Ponte Tonale have dedicated Wednesday evenings to kids with music, face painting, and torch lit walks - some mid-week fun that's well worth looking out for. Groups of mixed abilities will be doing somersaults in the snow over this resort's terrain for all: beginners can get to grips with short, blue runs, booking lessons with one of the mountain's schools (Ski & Snowboard school Tonale Presena or Ponte di legno - Tonale). If the majority of your party are intermediates, there couldn't be a place better to go, as 60% of this resort's runs are classified red. Head to the glacier to tackle top heights of 3016m - hire a guide for the day if you all fancy exploring with someone who knows the area inside out. If you've got some friends who haven't quite warmed to skiing, but like the idea of a mountain getaway, alternative daytime activities like dog sledding, natural ice rinks and wellness centres mean you won't have to take no for an answer. "We would definitely go back"
Passo is a good place for families - it was the UK half term week while we were here and we had virtually no lift queues anywhere, which meant we could ski wherever we liked! You probably have to be a good intermediate to enjoy the whole ski area. The family we met there had a daughter who was a nervous intermediate and she could cope well with most of the runs. There’s stuff if you’re more advanced and we took a few icy blacks over in a different village which were fun. There’s not a lot to do in the actual resort as it’s a fairly small town but we had all we wanted. If you want busy St Anton night life, Passo Tonale would be too quiet. It’s a perfect place if you want to get on with the skiing but have something to do in the evenings rather than just go straight to bed. We found a nice little bar where we could go and chat over some beers in the evenings. Everything seemed to be fairly reasonably priced, certainly cheaper than places in France and so forth! We were skiing in the middle of the season and the snow was very nice – there were a few icy patches and one day it was a bit cloudy but overall conditions were good. "Not the same scope as France but we had a great week of snowboarding"
We had an awesome week, this was our first snowboarding trip to Italy and we loved it. I think the weather helped, there had been a lot of snow prior to our arrival and we had more at the beginning of the week. The layout’s a bit funny compared to what we’re accustomed to in France and the skiing doesn’t have the same scope but it’s still a fantastic place. I’d describe it as a linear resort that stretches out along a main road. This makes it ideal for beginners as it’s impossible to get lost – wherever you are on the slopes you’re looking straight back down to that main road. The main slopes are also ideal for anyone new to skiing and snowboarding as they’re nearly all greens and blues and quite straightforward slopes. More experienced skiers and snowboarders might be getting fidgety towards the end of the week as the area isn’t massive. Having said that it’s so easy to get onto the off-piste from the lifts here, and I didn’t think it seemed as dangerous as the off-piste in France. The Italians didn’t seem to bother with the off-piste, and days after there had been snowfall I was still finding big areas that hadn’t been touched. One other thing worth mentioning is a really good link between Passo Tonale and the next town along, Ponte di Legno. You can ski or snowboard down there or there’s a gondola link, it takes about 10 minutes. It’s really lovely over there and a complete change of scenery. We had really poor visibility in Passo Tonale one day and went down to Ponte di Legno where there was blue skies and sunshine! It’s a ski area in its own right so we found a good amount to explore. There’s quite a lot to do in Passo Tonale as well as skiing, they have ice karting in the town (although it was too warm to do it while we were there) as well as snowmobile rides, pub quizzes and cheese and wine tastings. We had a half board holiday at the Eden (great hotel) but had a mooch around the town and found quite a lot of small supermarkets around, so if you were self-catering here it would be easy to get food – and the prices were reasonable too. Passo Tonale is built for skiing and isn’t really the best place to ‘do things’ if you’re not skiing. There are loads and loads of slopes and I like that they’re nice and wide. There’s also a long run down to a different area if you’re advanced and want to ski more black runs. We saw quite a few snowboarders there and they have a ski park for snowboarders too. You can get a fog as you’re so high, but we’ve been going there for 6 years and only had 2 days of fog which is pretty good going. The people are so friendly - we found the most amazing restaurant called Scorpio up on the mountain where the staff are really nice. There’s also a pizza place near the Miramonte hotel which was OK but we weren’t hugely impressed with and a good place for burgers if you don’t like Italian food... There’s a delicatessen up not far from where the main lifts are. One place you must go is La Vogila, which is amazing, Filippo who works there is fantastic. You don’t really need to go anywhere else as they do coffee, ice-creams, cakes and amazing cocktails – whereas back home you pay £8 for a cocktail, there you only pay 5-5 euros and it’s a nice tall one. Turin Airport is another thing altogether... last time we booked was good but all other times have been abysmal (one time we were waiting for our cases for 2 hours...). The other thing is that the transfer is quite long, although this doesn’t bother us. "Our 3rd week in Passo Tonale"
Passo Tonale’s a quiet resort and not very big. The locals are very friendly and it’s great for our family but it depends what you want from a holiday – if you want parties and karaoke it’s probably not for you! The resort has an ice rink although it wasn’t open when we stayed as it wasn’t cold enough. You can also do skidoos and dog sledding which we’ve done before (this was our third time back). We went to the local Italian bars rather than the reps’ bars – they’re really nice and friendly. We’ve used the ski school which is very good. The ski area is more beginner and intermediate friendly than advanced – it has some really nice wide slopes which is great for families if you’ve got young children. You can go on the glacier but if you were an extremely good skier, you’d probably want to go somewhere else... The snow (Christmas week) was good enough for us, though it got colder as the week went on and snowed on the day we left. "Good snow, good beginner-intermediate skiing"
I’ve skied a bit before but my girlfriend hadn’t – we chose Passo Tonale because it looked good for beginners and also because it’s high and we were skiing late in the season. It was as we’d expected and we had a really nice holiday! The conditions were a bit slushy towards the end of the day but overall they were good for the time of year. The ski area was fairly limited for me and I wouldn’t say it was a great place for advanced skiers but for beginners and low-intermediates it’s perfect. We went out a couple of evenings in Tonale – which included a cracking night in the place where our reps were based, which had live music. I really liked Passo Tonale. For a first ski holiday / if you’ve got children it’s perfect and my daughter (6 at the time) and I had a lovely week together. If you’re a beginner or intermediate, there are lots of good slopes and they all go back down into the centre so you can’t get lost. We had lessons with the ski school and were very pleased with the instruction; we just did a couple of hours each morning and skied together in the afternoons which worked well. "High resort - good snow"
Passo is quite a small resort and there’s not much there, but I’d ski here again. The good thing is it’s high – go to the glacier if it’s open as there’s a good black run as well as a couple of reds and blues (not to mention excellent scenery). We skied past the husky skiing place and had a go at that which was good fun. 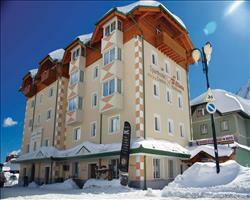 "Don’t miss the trip over to Madonna di Campiglio"
It was my first time in Passo Tonale, we had a great holiday. I would definitely recommend doing the day trip over to Madonna di Campiglio, that was very good. Passo Tonale is a very high resort so it was full of snow even though it was only New Years. It was quite busy. There are a few good bars and places to eat out – we ate at a little café at the bottom of the gondola and that was reasonable. They do fine food and a happy hour between 4 and 5pm (or maybe it was 4 and 6pm). Much cheaper than France. "not pretty or traditional but good skiing"
We went to a couple of places for a drink in the evenings and a few of the bars seemed OK. It was very quiet at the time we went, we did some off piste in a lesson with a guide and there’s a nice route that takes you down a long 14-16km trail down to the village. Overall we had a good experience on the piste. Passo Tonale itself is quite a modern town that goes along one long street – if you’re looking for a traditional town or something scenic it’s probably not for you. 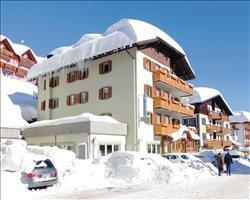 Ski Holidays in Passo Tonale With magical views, a variety of skiing and being snow-sure, Passo Tonale is a treat for any skier. Being relatively unknown, queues are kept to a minimum, and with an extensive coverage of lifts linking the towns of Tonale, Ponte di Legno and Temù together you can be sure to be able to explore this whole resort. A number of bars serve the après scene, such as Nico’s Bar and Bar Heaven, with a selection of nightclubs for those that just don’t want the après to end. 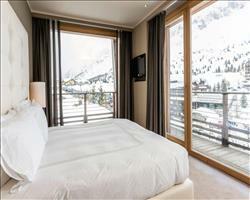 Tobogganing, snowmobiling and ice skating are but a selection for those with a quieter holiday in mind. 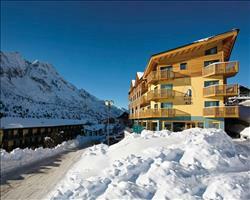 Passo Tonale Ski Resort is perched high up on the Rhaetian Alps and has exquisite views over the mountains of Italy. At 1883m, the town of Tonale is one of the highest purpose built resorts in the country, providing unrivalled snow quality, assuredness and an above average amount of sun coverage, allowing for those all-important goggle tan lines. Whilst the transfer time can seem quite long (2 hours 20-45 minutes from Verona), the number of departure airports in the UK makes up for this, as you are able to fly from Bristol, Edinburgh, Gatwick and Manchester. A rental car would definitely be recommended, as the ease of access to and from the resort to the airport, as opposed to a coach transfer, will give you more time to soak in the scenery and atmosphere of this picturesque resort. The town of Tonale has all the amenities available to make your stay easy and hassle free; for those on a budget there is a supermarket, rental shops and relatively cheap options for eating out, with pizza and pasta from only €5. For those looking to push the boat out and splash a little more cash, there are local speciality shops, as well as equipment shops for buying rather than renting your own kit. As the host of the Adamello Ski Raid, you could be lucky enough to witness an international spectacle. Usually later in the season (around April), this competition combines mountaineering skills at the high altitude that this resort offers. This race was not only set up to test the athletes, but to advertise and expose the rich history of the area; one such example would be the locality of the Winter War from 1915 to 1918. Providing both local and historical exposure, as well as the adrenaline of the Ski Raid, this event will be sure to appeal to almost everyone. With 6 different ski pass options, it doesn’t matter whether you’re a complete beginner or a prospective applicant to the Adamello Ski Raid, there will be an option for you. From the Adamello Ski lift pass, covering Passo Tonale, Ponte di Legno, Temù and the Presena Glacier (the areas in the immediate vicinity), to the Superskirama, covering these areas but also the Skirama Dolomiti Adamello Branta area, tripling the original ski area size to over 340km of runs. 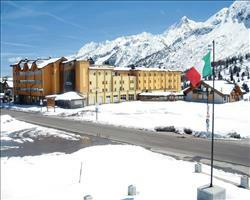 Whilst not well known, Passo Tonale has everything needed for all types of winter sports holiday makers. This relative anonymity allows trips here to have the potential of being much cheaper than other, more renowned places. 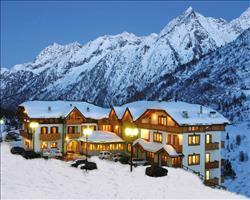 A resort definitely recommended for beginners to advanced-intermediates, as well as those sticking to a budget. Whatever your situation or intentions though, you will not regret your choice of this stunning destination. "Best place to learn to ski in Italy, maybe Europe"
Those looking to pick up skiing and snowboarding will think they have gone to heaven once they set foot in Passo Tonale. With over 110 instructors in both Tonale Presena and Ponte di Legno, as well as 50 years’ experience, you will be taught everything you need to know about skiing, as well as getting insider knowledge about the area. As a beginner, travelling far on numerous lifts to get to the tranquil runs can be a daunting experience. Passo Tonale simplifies this, with the majority of blue runs close to the town’s hotels and bars, for those all-important hot chocolate breaks. Although spread out, which makes traversing a must to be learnt as soon as possible, the variety on offer makes up for this. Intermediate skiers have the last laugh however, with 56% of runs in the resort being red, and of varying difficulty. The glacier offers a variety of reds, or if you fancy gliding through the trees, Ponte di Legno offers steeper, wooded runs. The Alpino run is particularly recommended, to provide more of a challenge for those feeling brave. Runs for those with a bit more experience are quite limited, with only 15% of them being black. With narrower tree-lined runs, head over to Temù for a more challenging selection. Also, if you make your way up to Cima Presena at 3015m, you can drink in the panoramic views before descending 1215 vertical metres on blacks and reds for a rollercoaster of a ride. However, the off-piste makes up for the lack of pisted expert runs. Being so high, the resort is relatively snow-sure, and can offer large snowfall later in the season coupled with beautiful blue skies. With lots of options available, one particular recommendation would be taking the itinerary route off the Presena Glacier, which will take you right back to the bottom of the village, albeit with a ten minute walk. A guide and the relevant equipment is a must have though, and with police doubling up as mountain rescue, safety is paramount. If freestyle is your thing, you will be in ecstasy with the new park. At 600m in length, with two separate lines catering for different ability levels and over 25 different features, you will be hard pushed to find yourself bored. Daily maintenance means the park is kept to the highest quality, and music playing throughout the day allows for riding in style or a great place to meet and chill out. In addition to the park, there is also a border cross over a kilometre in length, with popularity rising hugely since the Vancouver Olympics. Don’t forget your helmet though! "Better apres than I expected in a smaller resort"
For those who value the European après ski scene, Passo Tonale has plenty to offer, with ten bars catering to a number of tastes. The main place to go, coming the most highly recommended, is Bar Heaven; a great and lively spot to head to after a long day’s skiing, and with its happy hour providing two for one drinks, it makes it more affordable. Crazy Horse also offers a happy hour, and is a great watering hole for the weary legs. For the hard-core, the Miramonti and Antares nightclubs offer the chance to continue the après later into the night. 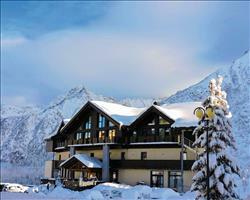 For a more sophisticated evening, Passo Tonale offers a wide range of nineteen restaurants. Whether you’re looking for fast food to fill you after a hard days skiing (try La Torretta for their filling pizza), or a more authentic, native dining experience (El Bait serves local, genuine cuisine), you won’t be disappointed. You can eat on a budget as well, with some local fast food dishes from €5, as well as being able to grab a three course meal for about €10, making it much more affordable to enjoy yourself than other resorts. It’s not all wining and dining however, and if you have children, or just fancy a break from skiing and après, there are plenty of other activities to keep you busy. For those who still want to feel that rush of adrenaline, the skidoo trip at night is essential, as well as the indoor climbing wall. And for those who just want a more serene evening or day off, you can glide on the natural ice rink, or simply float in the swimming pool. 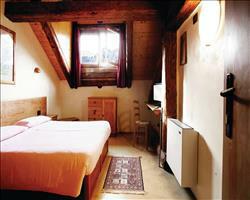 With such a variety on offer, Passo Tonale will not disappoint, whatever your idea of fun. "Learners and Families will be happy"